Are you at crossroads searching for the best archery arrows that are made of aluminum or carbon materials? Then you are in the right place! 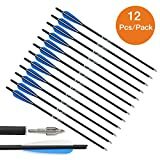 Before investing in arrows and bows, I heard many reviews on arrows. Some professional archers say aluminum materials make great arrows for beginner archers, while carbon arrows fly straight with great precision. However, I will be giving you tips on how to find the qualities that fit your bowing purpose. In this article, each segment helps you understand how to buy archery arrows wisely. However, while planning your next forest hunt, tournament or archery practice, also consider arrows with more kinetic energy. Long and mid-range hunting requires arrows with impressive accuracy. Archery arrows with top craftsmanship specifically for your bow are pro-grade products. You will see some of these arrows in the reviews below. Why do you need a right hunting arrow? How did we pick the best archery arrows? Regardless of your shooting style, the durability of hunting and archery arrows depends on the composition of their materials. Arrow shafts with the right balance of stiffness make hunting easy. The grains and spine rating of bow and hunting arrows also determine their efficiencies while taking shots at targets. If you want straight-flying arrows, then you need arrow shafts that don't oscillate too much. Reasonably priced and cheap well-made arrows should have the right shaft balance, and minimal oscillation after releasing the bow. Manufacturers of professional grade arrows often design them with techniques that offer technical advantages to bowhunters and archers. According to our archery arrows review, there are low-budget products that also offer consistency while taking straight shots. Apart from performance, the right hunting arrow must have safe handling and help you correct poor shooting form. If you need to invest in a right archery arrow, products with carbon-aluminum combinations might serve your purpose. When you fire, it's better to have the confidence in the arrow's spine consistency. These factors are critical for the performance that gives archers and bow hunter high levels of satisfaction. Apart from their cores, the nocks and straightness tolerances of arrows are important considerations before purchasing any brand. A local archery shop is where you can choose the right arrows. Before visiting the arrow retailer, you must find their performance and durability factors. So, after a period of testing these products with volunteers, beginners, pro-grade archers, and bow hunters can use our guide. Our team of experts presents the top 10 archery arrows with high-end features. Normally, after putting our budget-friendly and best archery arrows through a series of field tests, we share the report with buyers. Each product has its cons, important features, and qualities. However, we conducted field tests before choosing our top 10 archery arrows. The selection of volunteers and test crew was independent. They spent time in different our door environment to collect data and compare with the claims of respective arrow manufacturer. Before starting the review process, it's important to affirm that low momentum affects the impact of fast-flying light arrows on their targets. However, while checking their effectiveness, no specific product was perfect but they had extra features to their credit. The weight (grain) of bow arrows determine their penetration power. So, if you want pro or standard-grade arrows, try medium-weight arrows because of their precision, momentum, and speed. Men with large body frames and reasonable weight prefer to pull well-made arrows with the strings of compound bows. Ideally, hunting or archery arrow should weigh at least 400 grams. After releasing the bowstring, the arrows flew without interfering with arrow rest or riser. After testing the archery arrows, real-time information shows no defects with any of them. Additionally, there were sample reviews from buyers on each product. Professional bowhunters and archers also recommend arrows with higher performances. You are set to make a better buying decision after reading our overall review. Do you want to shoot fast-moving arrows with high penetrating powers? Shaft diameter, material, weight, and spine are few factors that affect the velocity of archery arrows. However, you will understand why low-quality carbon arrows are prone to split when they hit targets. Apart from fletching colors and technical advantages, other factors are too important to skip when buying archery arrows. The weight of an arrow is also called the grain, and its measured in grains per inch (GPI) or grains. During hunts, you can achieve deeper penetration power (momentum) and speed with heavier arrows. However, archery tournaments and target practices are better with the use of lighter arrows. Lightweight archery arrows often travel straight in the air with speed and more accuracy. It's their weight and streamlined construction that makes practice sessions very easy. As a bow hunter, shooting the right arrows will bring confidence. The arrow's length, spine, the stiffness of shafts, tip weight, bow’s cam, and speed can help you design a draw weight chart. You can have better performance while maintaining optimum arrow flights. Also, maintaining a convenient draw weight is critical for successful shots. The right draw weight of arrows prevents your hands from straining during archery tournaments and target practices. The draw weight of a good arrow makes it easy for you to make twenty consecutive shots. After the early 1940s invention of aluminum arrows, it became popular for archers to invest in bows. Generally, they are more expensive than wood and fiberglass arrows. The metallic material has low resistance to moisture and makes arrows durable. Apart from the durability, their uniform straightness and spine make aluminum arrows flexible. More so, manufacturers of aluminum arrows can enhance them with fletching colors and wraps. When other arrows hit aluminum arrows, the latter bends because of its material is malleable. Carbon arrows are stronger, and with high precision, they fly straight. They can also be weaved to make them compact without splitting after being hit by other arrows. The use of carbon shafts is a popular choice for many compound-bow archers and bow hunters. Their durability comes from tough carbon materials, and make linear travels with great momentums. However, archers should be careful while shooting carbon arrows because they could splinter and hurt the archer. Lightweight hybrid arrows emerged after many years of having arrows with single composite materials. New shafts were made with carbon and covered in aluminum. The material strength of aluminum carbon-fiber arrows makes them have popular demands from archers. Generally, hybrid arrows are light and have high kinetic energy transference. Wooden materials were used to make the early generation arrows like in the 'Hunger Games' movie. This inexpensive arrow is often called old-school arrows because they are prone to breakage. Wooden arrows are not obsolete; they are used by traditional bow hunters and archers. Despite their penetrating powers, it's time-consuming to make wooden bows. It's also difficult to find modern compound bows or advanced crossbows that fits wooden arrows. The spine of an arrow plays a critical role while aiming for a perfect shot. The spine increases an arrow's stiffness and makes align on the bow's arrow rest. How do you know your specific bow setup with arrows? Thicker arrow spines affect the accuracy of your shots. To take spine measurements of arrows; bend the shaft while suspended, calculate its number of inches and multiply by 1000. Carbon materials make arrows stiffer than their aluminum rivals. Always use strong and moderately heavy bows for arrows with rigid spines. Do you know that an arrow's mid-section is the arrow's shaft? The length of the shaft is an important material to consider when buying your favorite arrow. The distance between two points; from the arrow tip to the nock is your arrow's length. Cut an arrow shaft and hold vertically below your eyes. The distance from one half of the surface area to another is its diameter. The shaft helps the arrow attain proper flight projection. Arrows have to be stable to gain control and minimize the effect of wind drift. Large diameter-arrows are more durable, and not prone to breakage. A Fletcher gives arrow support and stability. These attributes are basics for buying fast-speeding arrows, also with the accuracy. The fletching material come as two types and are attached to arrows. Plastic vanes offer durability and are flexible. They are attached to different lengths of arrows; they are waterproof and heavyweight. The advantages of plastic vanes are moisture proof function and impacts on targets. The oldest type of Fletcher is a feather fletcher. Traditional hunters and archers love it. A feather fletcher is a lightweight material that's noisier than the other type. Its weight offers much stabilization to an arrow during its flights. Feather fletchers are crafts with coordinated trajectory when they are hit by obstacles. The disadvantage with feather fletching material is its non-weather proof feature. Every archer wants to shoot accurately at the bull's eye. During shots, the arrow's front-of-center (FOC) allows more accuracy over great distances. The FOC determines the arrow’s trajectory pattern and curvature. Apart from accuracy, the arrow achieves more stability during flight when its FOC is high. The broadhead factor helps arrow blades maintain their weight as they cut through the wind. Arrows with compact broadhead enjoy seamless aerodynamics after releasing the bowstring. Before hunting, it's great to know how well-made is the broadhead of arrows that suit your bow. While addressing your shooting needs, consider what type of arrow fits your needs. For long-distance archery practice, your arrow should have the right grains per pound of draw weight. While aiming, thin and heavy arrows offer balance to your bow weight. Also, for hunting arrows, a heavier arrow ensures much penetration power. Getting the right balance of the arrow you need is the main factor and between 8 to 10 grains per gram weight is ideal. Generally, demands for top quality bows are spiking their prices in the global market. However, affordability is an important factor to consider before purchasing bows. While planning to get value for money, the price might vary for similar brands of arrows. Aluminum carbon-fiber or single composite arrows sells for between $30 to a thousand bucks. Our best archery arrows review will guide buyers with low-budgets. The basic rule of the thumb for choosing our top 10 archery arrows was to identify the purpose each could serve. For archery target practice, lighter arrows are preferable while hunters love heavy arrows because they take more kinetic energy to targets. Always know what suits your bow before purchasing crossbow arrows. So, the grains per inch (GPI) or grains value is important. The spine rating shows how much energy transfer goes from the bow to the arrow. Arrows with spine rating close to 300 are ideal. A spine rating of 500 will make arrows oscillate and flex too much. It's expected that an arrow's shaft thickness can impact on the weight. The combination of carbon-aluminum materials will lead to heavier arrows. However, arrows with thin shafts are less affected by wind, and broadheads can give them great air resistance. Are you preparing your gear from hunting or 3D archery sessions? Choose from our top 10 best products, the kind of arrow that suits your needs. We chose the Archery Carbon Arrows by MS Jumpper as our top product for target practice and longbows. The carbon arrows have attractive fletching and impressively designed protective sheaths. It's the design of the tip that makes the MS Jumpper arrow sticks on to targets. Also, it's easy to retrieve this arrow from hardwood boards during target practice. Let’s share the amazing features of this product. Lightweight : This lightweight 100 grain fast arrow is suitable for compound bows with draw weights of at least 65 lbs. Bow hunters should ensure the MS Jumpper carbon-fiber arrow properly aligns the bow's whisker biscuit; it ensures straight travels. Carbon-fiber shaft : Even at 100 yards it's fairly easy to hit targets and the bull's eye while using this archery carbon arrow. Its carbon-fiber shaft has a diameter of 7.4mm. The MS Jumper carbon arrow is made for better performance and offers low hand shock. The forward end of the fletching is well-made to increase the protection of fingers during use. Durability : Arrows with carbon-fiber materials are durable and their sturdy composition offers the right balance for steady flights. The quality of material also ensures easier extraction from the targets after taking a shot. The MS Jumpper arrow can be reused during target practices because of its durable attribute. High speed : Arrows make deeper penetrations at high velocities, and they are often accurate with impressive carbon bolts. This product retains speed, consistent arrow departure, and precision during bowhunting. The fletchers attached to this arrow might come off after extensive use. Beginner archers and hunters will choose arrows with carbon-fiber shafts because of their straightness. The versatile carbon-fiber arrows come with two black, and one red 4-inch peltate shape real feathers. They offer hunting precision and penetrate deeper with high kinetic energy. Our field test shows the arrows have high consistency when flying straight. Unlike traditional arrows, the MS Jumpper arrows are sold at affordable prices. The reasonable price tag on this product makes it one of the most popular types of arrow. The Bear Archery safety glass-vane arrows have high-quality craftsmanship. If you’re looking for the fiberglass arrows that are compact and durable, the Bear Archery arrow is available. Beginner youth archers can practice with this product because it does not splinter. Let's share other amazing qualities of these arrows. Durability : Generally, safety glass-vane arrows are weatherproof and durable. The impressive design ensures much ease of reuse, and this feature makes the Bear Archery youth 30-inch arrow a unique brand. Youth archers might not have to re-purchase this fiberglass arrows as they become professionals; they can save money. The durability of this product boosts its cost-effectiveness. 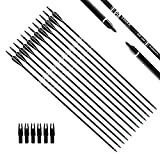 Stylishly designed : In the pack are different sizes of arrows, the range is four lengths 24, 26, 28, and 30 inches. They are exceptionally stiff arrows that are ergonomically designed. On these arrows, each fletcher is two inches long and 0.5 inches high. The straight-flying arrows also have high flexing qualities. For Target Practice : As beginner bow hunter or archer you can use this top-selling hunting arrow for bows with 40lbs (maximum) draw weight. Alongside a well-built archery target, arrows with proper vanes fletchers and installed nock and points are also helpful. More so, the fiberglass construction is safe for use because the shaft doesn't splinter when there's an impact. Low noise : This arrow transforms energy during flights, and produces low noise. This material is good for hunting in the forest where game animals will not be distracted. The Bear Archery arrow is one of the quietest products on our list. The packaging of three arrows per card is a small option for archers that intend to practice many shots. The metal heads of Bear Archery arrows have good penetrating powers. When they hit targets, it also easy to retrieve this fiberglass arrow. This product fits traditional bows, and it's ideal for young people. Do you have young archers at home? Get them a pack of archery accessory and put a smile on their faces. Even when these arrows are not prone to splintering, they are fragile and should be handled well. This glass-vaned arrow is ideal for low-budget and stylish buyers. The Pile Driver arrows by Carbon Express have great penetration, and they look beautiful with 4-inch vanes of fletchers. If you are looking for strong carbon cross-bolts, the Carbon Express Pile Driver can go through many shots without splintering. Here are the exciting features placing this 442 grains bolt on top archery arrows' list. Good Craftsmanship and Durability : The six-in-a-pack carbon bolts have inserted moon nocks, and they are sturdy constructions. With their impressive 4-inch vanes, the fletched carbon bolts also have compact broadhead. Their composite material and nock collars are tight, and they act as buffers against nock end impacts. Carbon is a durable element; they offer great performance and are reliable. Greater accuracy : The blade's weight balances with the arrow's speed as it cuts through the wind. This Pile Driver is our recommendation for archers that want their arrows to have greater accuracy and spine consistency. The 4-inch vanes offer support during flights and make precision seamless. Superb Penetration Power : Generally, arrows with 100-grain field points are impactful on targets. Their momentum offers piercing powers during target practices and archery tournaments. Bow hunters and archers are confident when their bolts strike with superb penetration. This product is made for the hunter who wants to feel the impact of maximum kinetic energy. Straightness: Our test confirms the straightness of this Carbon Express Pile Driver arrow as +/- 0.004 inches. If you are set for target practices, be confident of using bolts with maximum consistency. The Pile Driver bolts are lightweight carbon arrows and can be used for small bows. It has much penetration power and might be hard to pull off targets for reuse. The Carbon Express stiff- spine arrows are designed with high-visibility features. Their carbon material offers much repeat consistency and strength to these cross bolts. These arrows are compact with low (350) spine rate. A pack of six bolts with universal flat nocks, and inserted moon nocks that align with bowstrings. Additionally, arrows that are consistent with their performance and also have reasonable price tags are better products. However, this is a good choice for buyers in need of carbon arrows that are accurate! The set of five Barnett Outdoors carbon arrows are 20 inches long. At 13.78 grains per inch, the lightweight arrows are also durable. The arrow’s carbon structure improves its penetration power and velocity. This product also transfers energy with ease. Here are other features that put the Barnett Outdoors crossbow arrows in this list. Target Practice : Beginner archers and deer hunters will find these lightweight arrows ideal for practice. During target practices, and forest hunts they offer long range trajectory. By using lightweight carbon shafts on crossbows, target practice becomes enjoyable for new and young archers. Reliability : Denser arrow shafts are reliable especially when crafted with high-quality carbon materials. The measurement of 13.78 grains per inch rating offers consistent thickness to their internal diameter. Their compact material makes the Barnett Outdoors crossbow arrows stronger and reliable. Maximum Penetration : Buy the 20-inch Barnett Outdoors bolt if you want to experience the momentum of carbon arrows. Their dense, lightweight carbon shaft supports maximum penetration and accuracy. Even after several shots, the nocks are intact after pulling the bolts from hard body targets. High Visibility : Their orange color fletching makes these Barnett crossbows bolts attractive and highly visible. The orange tips help to track the trajectory of arrows flying off-course or drifting with the wind. It's easy to spot them in tall grasses, and these fletching vanes are compact. It is versatile, and you can use these hunting arrows with different bow types. The 20-inch Crossbow bolts fro Barnett Outdoors are compact designs. The machine crafted arrows have more consistent wall thickness. Their orange tips are weatherproof and make it easy to recover arrow from hard target penetrations. The strong lightweight and high-quality carbon arrows are extremely accurate. Their design allows for weight adjustment by attaching inserts or nocks. In summary, the Barnett Outdoor crossbow bolt is what you need for target practices and deer hunting. You can win your next trophy by using crossbow arrows with consistent accuracy. The Maxima Red Fletched Carbon Arrows are six in a pack, and each has a blazer vane. The bolts displayed precision and broadhead accuracy during our field trials. Let's share some other amazing features that make the Maxima RED fletched bolts one of our top picks. Dynamic Spine Control : The dynamic spine control design is the bolt's game-changing feature. It's the arrow's stiff tip that carries the in-flight flex. Also, the dynamic spine control improves broadhead accuracy during flights. This composite carbon material gives a sturdy construction. Additionally, the dynamic spine control makes this product a top-quality hunting arrow from Carbon Express. Launchpad Precision Nock : The launchpad nocks enhance the appearance of the arrows' shafts. 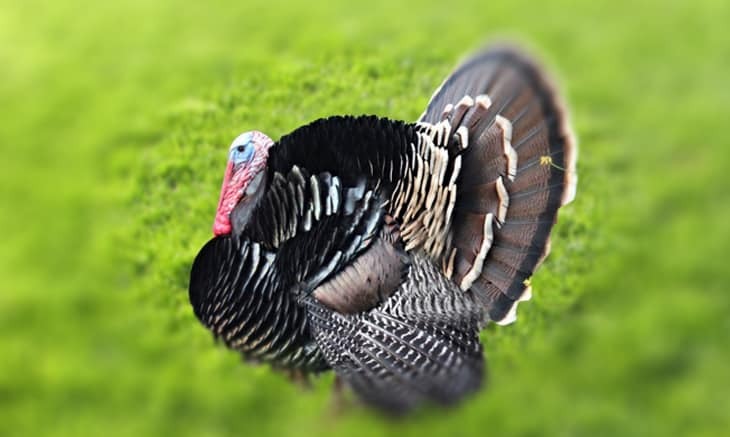 Apart from being stylish, the nocks control arrow release and increase their flight accuracy. With proper shaft alignment, the Maxima RED arrow hits targets with high precision. The nocks are covered with BullDog collars to increase their durability. Hi-tech carbon design : Are you searching for a premium arrow brand with consistent weight arrow for hunting? The Maxima Red arrow has spine measurement of 0.342 inches and weighs 414 grains at 29 inches. With 8.11 grains per inch rating, it stands as one of the top-quality carbon arrows in the market. More so, the Maxima RED arrow has a weight tolerance of ± 1.0 grain. Shaft straightness : When this carbon arrow's shaft goes under laser beams at 1/10,000 of an inch, the straightness has a tolerance zone of just +/-0.0025 inches. They are suitable for use with bows that have draw weight ranges of between 40 and 81 pounds. The 6-pack of red and black styled blazer vanes and dense carbon material construction make these arrows appealing. The high-end styling and features boost the arrow's visibility. It's easy for hunters and archers to retrieve them when they go off-target. However, the Maxima RED arrows are not cheap, but they are top archery arrows that offer value for money. One of the best-sellers, the Jazz XX75 Aluminum arrows are available as the 1716s, 1816s, and 1916's. These arrows come in aesthetic feather fletchers and complete coating of Aluminum on the dense shafts. With the right weight and fletchers to spin the shaft in-flight, the Jazz XX75 maintains the speed needed for a hunting arrow. Let's see how it came in on our list of top archery arrows. A sturdy construction: Aluminum, a long-lasting metal, is the core of this tough and waterproof Easton XX75 Jazz. Aluminum Arrows. Generally, aluminum composite materials make excellent arrows for a series of shots during target practice. They are strong against impacts. Aerodynamic Advantage: The Jazz XX75 arrows by Easton has much resistance to air friction and impressive precision. Their streamlined shafts give them some aerodynamic advantage over wind drifts. They can cut through the air readily with built-in sharp steel tips. Stability and Support: The feather length varies according to the length of the arrow's shaft. During in-flight travels, the feather fletching uses the right-wing helical offset to spin the shaft. The resulting in-flight trajectory is supported by the Easton Jazz Aluminum arrow's parabolic feathers that stabilize and minimize the reactions from the wind. Great Penetrating Power: The Jazz XX75 by Easton has momentum with great penetrating power, that allows you to retrieve the arrow after intense hits. Its static spine gives it a sturdy structure that converts kinetic energy on impact. If you desire to buy fast-speeding arrows, Feather Fletched XX75 by Easton is worth your consideration. Different Options: These aluminum arrows come in options. The 1716s and 1816s have similar features because they have cut-to-length sizes. Also, the 1916's cut-shafts have aluminum inserts with screw-in (100gr) points. Arrow weight: between 320 and 470 grains. You can adjust the orientation of the Nocks. It still bends even with the composite aluminum finish, but it's not common to find them splintering. 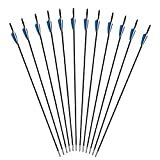 Do you prefer durable arrows with unique precision for archery learning? These arrows are reliable and can be reused to make many shots at target points. Also, they're ideal for kids (at least 3 y/o) outdoor target practice sessions. The Jazz XX75 Aluminum Arrows by Easton is a fast-selling product for bow hunting and archery. Bottom line, these are among the aluminum archery arrows for beginners. The 30-inch hunting carbon arrows by Tiger Archery comes in a pack of twelve pieces. They are made for crossbows with low weights, and they fly straight with more accuracy. You'll enjoy hunting and archery with these carbon arrows if you use recurve, or compound bows with weights of between 40 to 60 lbs. Let's look at the features that our experts and volunteers tested on the field. High-end designs : The machine-crafted Tiger Archery arrows have hi-tech carbon construction. These arrows are well-made with stainless steel tips, carbon shafts, colored rubber fletchers. Also, you'll find six (free) replaceable nocks with the package. If you want arrows with top-notch construction, this is the best bow for hunting and archery practice. Durability : The manufacturer's choice of carbon makes the arrows compact and durable. Wind drifts have low in-flight effects on this arrow. Even weather, moisture, and environmental effects are resisted by steel tips and plastic fletchers. They are durable for target practice because their multi-layered design reduces any risk of splintering. Stability : With a measurement of 13.0 grains per inch, the Tiger Archery carbon arrow is are stiffer at the rear than the tip. The fletchers offer flight stability, while the spine ensures a low rate of oscillation after releasing the bow's string. However, lighter (nickel-plated stainless steel) tips provide pinpoint accuracy and more penetration power. Affordability : These precision carbon hunting arrows have reasonable price tags. They are basic carbon arrows with good performance. Also, they are popular because of their affordable price. The price of 12 arrows per pack will appeal to young archers and hunters. Nocks and fletchers are not fixed with glue. They may fall off, but they can stay by firmly after using glue. These carbon arrows by Tiger Archery are well-packaged and affordable. During hunts and target practices, these arrows provide better accuracy, and tack driving performance. They might not have premium features or enhanced visibility, but their durability helps you save money. Do you want more value for money? 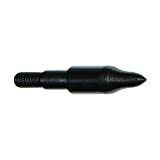 Buy this incredibly cheap high-impact crossbow bolts by Ace Martial Arts Supply. They are available in a pack of 36 pieces and compatible with crossbows that weigh 50 and 80lbs. With a grain weight of 6.5 inches, the performance of this arrow makes it them appealing to many archers. Here some other features that make the Ace Martial Arts special. Great Precision : Being a lightweight high-impact bolt that works on 50 and 80 lbs crossbows, its aluminum frame reduces in-flight frictions. The arrow pierces through the air at hits targets with great precision. Also, Ace Martial Arts aluminum arrows are flexible, and their vanes leave bow strings without interference. Durability : The sturdy metallic finish is durable. Also, the aluminum body and pointed end enhance the reuse of these arrows. You can start early 3D archery target practice, and save money by using the same set of Ace Martial Arts arrows while in standard grade. Affordability : This product suits your purpose if you love to hunt small game animals like birds, squirrel, and rabbits. They cost only a few dollars, and you can buy extra packs of 36-pieces at an affordable cost. It requires many shot sessions to boost your archery skills. Also, the choice of cheap arrows will fit your plan if you have a tight budget. The Sturdy Construction : During our test with a 50lbs crossbow, the high impact bolt pierced through three sheets of cardboard paper. Its aluminum shaft carries a metal tip and fletchers that are 0.6635 inches wide. The aluminum shaft has uniform straightness, and the fletching material offers much stability. This cheap bow has good quality, and I'll recommend for young archers with tight budgets. However, these high-impact Ace Martial Arts arrows have amazing speed. You can lubricate their metal tips for smooth penetration. The aluminum shaft bolt attaches firmly to the nock and Fletcher. After many practice shots, the durable bolts can serve future use. Make haste to buy a pack of 36 arrows for your target practice and small game hunts. Do you need practice arrows of fiberglass composite materials? 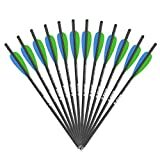 These archery arrows are compatible with traditional and recurve bows. Also, the fiberglass Archery Target Arrows is ideal for beginners. They come with soft plastic vanes for stable in-flights after releasing the bow's string. Let's share some features behind this amazing craft. 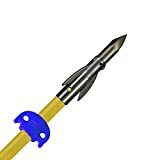 For Target Practice : If you need cheap archery arrows for children and beginners, this arrow is ideal for learning. These are target practice arrows with field points, and they offer superior performance to kids and new archers. The fiberglass arrow is suitable for crossbows with at least 45 lbs draw weight. Ideal for Soft Targets : The fiberglass shaft aids proper in-flight projection of these arrows. While using traditional and recurve bows, the blade's broadhead increases the flex of these arrows. If you are searching for high-quality arrows for softer targets, the Fiberglass Archery Target Arrows are ideal for that purpose. Straightness Checked by Laser : With shaft straightness confirmed under laser beams to 1/10000 of an inch, these arrows have tolerance zone of just +/-0.0025 inches. The Fiberglass Archery Target is a lightweight arrow long-range shots. However, the tips of these arrows have threads to screw in and out of the shaft. Highly Visible : The 28-inch fiberglass hunting arrows have multi-colored fletches that allow users to track their trajectory. Their high visibility allows easy retrieval from tall bushes at the backyard. They also look colorful and appealing to kid archers. These fiberglass archery arrows are designed to help beginners improve their skills. They come in multi-colors for enhanced visibility. After extended use, these arrows shatter in their midsections. Our experts are confident of these Fiberglass Archery Target arrows. They have low noise during flights and impressive target penetration. During practice, you will find high resistance to air friction because of the metal tips. Soaking the fletchers in hot water can align them to their original shapes. Also, to avoid splintering, don't shoot these fiberglass arrows at hard targets. The 30-inch ANTSIR Outdoors carbon arrow weighs 432 grains. They are removable arrows, sold as twelve lightweight pieces in a pack. This product is ideal for aiming small game animals. Also, the arrow is ideal for bows with at least 40lbs of draw weight. Let's discuss other features that our experts highlighted during the field test. Compact Design : The removable stainless steel tips and nocks can be adjusted to suit your purpose. The bullet tips have deep penetrating powers, and they are no prone to cracks. These carbon arrows have outer diameters of 7.8mm and are less affected by wind. Durability : High-strength safety shafts with composite carbon are durable. Their shafts can easily bend even when they hit hard targets. While looking for longer-lasting arrows for your target practice, remember that carbon fiber provides good performance and are stronger. High Visibility : The lightweight carbon shaft is strong, and visibility is high at the rear. With colored nocks and plastic fletching vanes, it's easy to track these arrows when they go off targets. For optimal accuracy, the visibility of these arrows has been improved with ergonomic detailing. Straightness : With +/- 0.006 inches the straightness, the ANTSIR Outdoors 30-inch arrow has weight sorting tolerance value of +/- 1.0 grains. While using this product, you'll discover that every shot comes with consistent levels of accuracy. The lightweight carbon arrow has steel tips that offer amazing penetration power. The stainless steel tips are removable and might wear with repeated adjustments. Use glue to hold the tips when there screw-in thread wears. If you have a 40 lbs draw weight bow, always use the arrow rest while taking aims at targets. Plastic vanes with bent shapes can be straightened by dipping that part into 176℉-194℉ hot water. The ANTSIR Outdoors Carbon arrows shoot straight and accurately, and they are durable. Game equipment and accessories are maintained to last longer. The tools you need to enhance your archery skills can still serve after you become a professional. Unlike other sports, archery and hunting gears are expensive. So, it's proper to keep archery bows, and arrows in good condition. Here are some few maintenance tips for archery arrows. Ensure that the metal tips are screwed in properly and tightly. Don’t bend the shaft of arrows because it will alter their straightness value, frequency, and oscillation. There will be inconsistencies with shots fired by bent arrows. Also, the noise and vibration will increase during in-flights, and it might scare your game animals. After evaluating the features and performance of our top 10 archery arrows, I hope it's easy for you to find what serves your purpose. However, the best archery arrows for beginners might be different from pro-grade categories. Our team of volunteer and experts took painstaking steps to confirm the performance of the products under review. The ANTSIR Outdoors 30-Inch Carbon Arrow has all it takes to cover long-range shots because it's 7.8mm outer diameter bring more resistance to air friction. If you are looking for durable arrows, choose the 20-inch Pile Driver by Carbon Express. They can help beginners with their archery target practice session. I am optimistic that at least one of them will match your budget. We would be glad to read your feedback after purchasing your favorites arrows. 6 How to Use a Red Dot Sight for Utmost Shooting Accuracy? 7 How to Aim A Long Bow for Perfect Shot Every Time? 8 Holographic Vs Reflex Sights: Learn the Key Differences in Just A Minute! 9 How Do Holographic Sights Work? Learn in Just 5 Minutes! 10 Reflex Sights Vs Red Dot Sights: Six Key Differences You Should Remember!